"Be happy, for if you wanted to humiliate me, I confess that I feel my entire body is suffering with degradation." These are the words written by Somayeh Tohidlou on her blog after she received fifty lashes yesterday while her hands and feet were chained together. 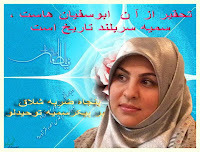 Somayeh Tohidlou, a PHD student in Iran was one of Mir Hussein Moussavi's campaigners. Somayeh was arrested one day after the 2009 fraudulent elections. Eight men broke their way into her house at 3:00 am and searched her residence for an hour, confiscating her camera, laptop and other belongings. She was sentenced to one year prison and fifty lashes but was finally released on a $200,000 bail. Her sentence of fifty lashes, for having insulted the 'president' remained however and it was executed yesterday. Today, Somayeh's facebook page was inundated with messages of support. Mohammad Ali Abtahi, former advisor to Khatami, wrote: "Everyone who knows Somayeh Tohidlou, regard her as a symbol of reasonableness, moderation and character. Today when I learned she had received 50 lashes for having insulted the 'very respectable president', I felt it was the Iranian pride which had been flagellated and not Somayeh's body. Somayeh, you are the only one who has not been humiliated as a result of this sentence"
And indeed, Somayeh should feel the proudest. It is this regime which has humiliated itself by whipping Somayeh and it is the rest of us who should feel humiliated for having allowed this to happen. It is us, Iranian men, who sit by and allow our mothers and sisters to be treated in this way who should feel the humiliation and it is us, the Iranian expats, who allow the likes of Ahmadinejad to travel around to UN and grab the limelight in his TV interviews and make absurd remarks such as 'Iran is the freest country in the world' and receive celebrity treatment by incompetent American interviewers, who should feel humiliated. I have your post with my 'circle' in the United States. I am sure others will oppose me for the post because the general consensus is that Iran and Iraq are evil. Their entire base of education is the 2 minute news story they see at 11:00 while waiting for the sports report. I know different. I know better. As an Irish-American I am just as embarrassed by what Timothy McVeigh did in Oklahoma City as you are for the sect of bad Iranians have done for the reputation of your entire people. Thank you for sharing that post about Somayeh Tohidlou. I hope it reverberates positively about the atrocities of speaking out against corruption. 1. Does your government plan to allow the U.N. Special Rapporteur on the human rights situation in Iran, Dr. Ahmed Shaheed, to visit your country and investigate allegations of human rights violations? 2. Do you approve of the house arrest of your former election rivals, Mir Hossein Mousavi and Mehdi Karroubi? What is the basis for their confinement? 3. How do you respond to charges that high-ranking officials enjoy impunity for human rights abuses in Iran? 4. Do you feel you are in a place to criticize Arab governments in Egypt, Libya, Bahrain and even Syria for their response to public protest when your own government has used force to subdue peaceful protests on many occasions? 5. How is it that Iran has become the world’s leading practitioner of the death penalty with the highest per-capita executions? No truer words could be said about a nation's shame under Khamanei's black vulture tyranny... And at the risk of repeating myself, this is the shame of the multiple M's! Male Machismo. Malicious Mullahs. Medieval Mafiaso! Each lash is an insult to democracy, rationality and a cultured artisic intelligent conscience. Mitch K,, comparing McVeigh in Okcity with Iran is totally dumb on many levels. For one thing, McVeigh was a single person, not acting as part of an Irish or a Catholic Sect! Irish sects dont present a threat to America, or the UK, any more. The greatest threats in America are not Irish Americans, catholics or protestants! News for you, recent embarrassing burning down the house threats in the UK riots were ENGLISH born and bred me dear!! As repugnant & horrific it is that Iran's women should be treated in such a sadistic & cruel manner, the sad fact is that women all over the world are abused & murdered in every manner possible that is unimaginable. Including the practice of female circumcision on little girls as young as 4 yrs. of age, an act so heinous many of these children die. That women & children alike continue to suffer so at the whims & the hands of men is a fact that should be stopped at any cost. In the U.S. women who have been summarily abused violently over several years to the point of death who FINALLY strike back to save their own lives by taking the life of their abusers are thrown in jail & most given life sentences. passes by our laws here over & over again w/ no protection for the women they abuse until finally many of these women are murdered. Once again we, women here in the U.S. find ourselves in this so-called "free" society fighting for our right to our own bodies, our right to abortion but there is a movement afoot who would deny even women who are raped this basic human choice. There are men in Congress here who are seeking to pass a bill that women who are raped can not be referred to as "victims" but instead should be referred to as "accusers" in a court of law. This would imply that the defendant, not the accused is the one who should be held in doubt. DEMOCRACY doesn't spare or protect it's women. DEMOCRACY is a fallacy in this country. Not only to women. But also to children, immigrants, lesbians, homosexuals, trans-gendered, people of color & the only "TRUE AMERICANS", the Native Americans who mostly still live on reservations where the conditions are so poor, these incredible people stand little chance of ever grasping at the "American Dream". For them, the "American Dream" means genocide & the holiday "Thanksgiving" is a symbol of their demise. This behavior in men is as old as our human beginnings. Will women & children ever be safe & free from this tyranny in any society or in any age? religion, country, age, etc.. Our gender should bring us together in solidarity to continue to fight for our rights & for freedom from suppression, oppression & violence from men until the day comes when we can walk down a street w/out fear, look to our fathers, our brothers, our partners & male friends for the protection & kindness they should provide for us rather than the protection we seek to keep them away from us. As far as Ahmadinejab & his UN visit here, whatever the news reports, Americans are finally waking up to the fact that we can not trust the media & I doubt there are many people here who are ignorant enough to believe any thing that comes out of the mouth of that tyrannical despot. I said many not all. Again, I applaud S. Tohidlou & her bravery & I send her many blessings & much gratitude. I imagine she is a reluctant hero but reluctant or not she is a symbol for calling women to action to stand fast, stand tall & stand brave TOGETHER against the chains of oppression that internationally bind us.